My wife and I were able to secure a nice block of extra firm tofu last week, and we were excited to come up with something different that didn’t involve pasta or rice. Then, boom! It hit us! Let’s do sizzling tofu! 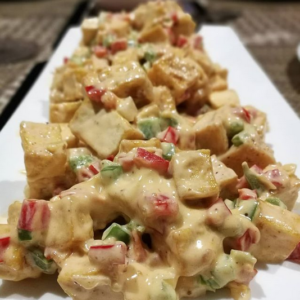 In Manila, restaurants like Max’s Fried Chicken serve up in a sizzling hot plate some fried tofu that they mix with a flavored mayonnaise. It’s flavorful and delicious–not the healthiest way of preparing tofu, thanks to that mayo–and our kids enjoyed it. So here’s what we did! In a large saucepan, heat the oil. Deep fry the cubed tofu until lightly browned. Remove from the saucepan and place on paper towels. In a separate, equally large saucepan, over medium heat, sauté the capsicums and onion in two tablespoons of butter. Add the fried tofu and fry about two to three minutes. Pour the sauce into the saucepan. Stir and continue to cook, about two minutes. . Transfer onto large serving plate and serve immediately. A few days ago, I realized that I had some potatoes that weren’t moving. They’d been there a few days, and I hadn’t done anything with it. So I looked in the freezer, found some pork steak, and put together a quick and easy fry that made this dish a home run with my kiddos! 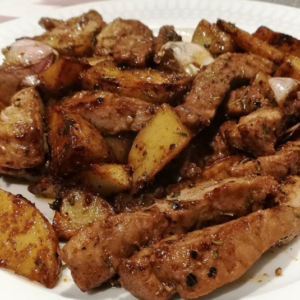 Check out this fast recipe for garlic pork steak with potatoes. A third cup soy sauce, one tablespoon olive oil, and a few dashes of Frank’s Red Hot for the pork marinade. 1. In a large bowl, combine the pork steak strips with a marinade of soy sauce, olive oil, and hot sauce. Leave for about 30 minutes. Meanwhile, boil your potato quarters for about ten minutes. 3. Set a large pan to medium-high heat. Combine one tablespoon olive oil with a tablespoon of butter. Drop the potatoes in and cook until golden. Remove from pan. 4. Put two tablespoons of butter back in the same pan, and add the pork. Cook on both sides until lightly brown, then add the potatoes and remaining marinade. Cook until done, remove from heat, and serve immediately. 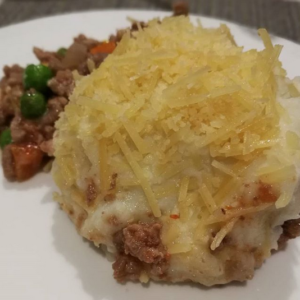 The other night, my wife and I prepared a no-bake shepherd’s pie. A perennial kids’ favorite, we divided our pie into two sections–one with a vegetable medley of peas, corn, and carrots, and one that was meat-only–and served that to our kids. The best part? It tastes great, even without baking! Give it a try! Set your stovetop to medium-high, and place two tablespoons of oil in a large pan. Brown pork and beef in the pan. Add onion, garlic, and soy sauce. Stir-fry until meat is almost cooked. Add vegetable medley and sauté until meat is fully cooked. Prepare instant mashed potatoes according to instructions. Put the cooked meat in a serving dish (drain extra oil, if you have any). Create a layer of mashed potatoes atop the meat. Top with grated Parmesan cheese and serve. Oh, adobo. 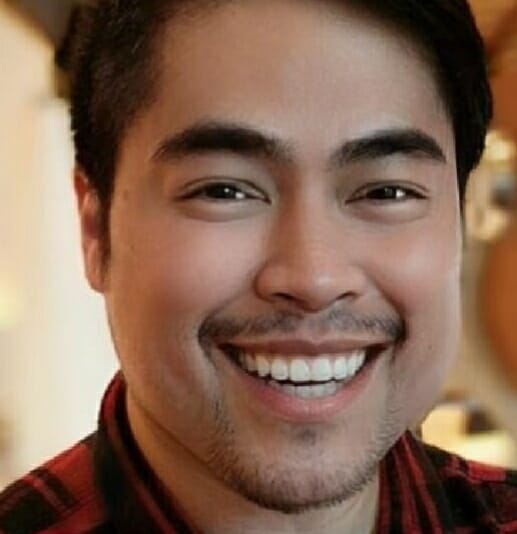 Filipino families across the world have such fond memories of you! And depending on the region, we will have different versions of adobo. My mother, who comes from Iloilo, makes her adobo dry, with mountains of garlic, crisp and crunchy and flavourful. My wife, who grew up in a Filipino-Chinese household, knows adobo for its salty-sour soy-based sauce and hard-boiled eggs. For this particular blog, we whipped up the latter. Heat oil in a large nonstick over medium high heat. Add chicken pieces, and cook until lightly brown. Add pork cubes and brown sugar, then sauté for another five minutes or so, until meat is cooked. Add soy sauce, bay leaves, and water; bring to a boil. Reduce heat to medium strength, and simmer until meat is tender, about 45 minutes. Add water if levels of sauce get low. About 15 minutes in, in a separate pot, put six eggs and fill with water until eggs are submerged. Add a teaspoon of salt, and bring water to boil. Once water boils, remove from heat and let eggs stay in water about ten minutes. Peel. When meat is tender, add hard boiled eggs to adobo. Simmer for about two more minutes, gently stirring, and transfer to a large bowl. Serve with piping hot rice. Last night, I took the family to Lolo and Lola, a popular Filipino restaurant here in Canberra. It was “Jollibee Night” for us, and the owners were serving up their spin on some of Jollibee’s most-loved classics, including Chickenjoy and Burger Steak. 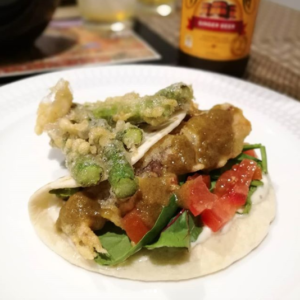 It was the first time for my wife and me to take our kids, and we were concerned they wouldn’t appreciate this Fil-Aussie take on their favourite foods. But our fears were completely unfounded, because they enjoyed it immensely! 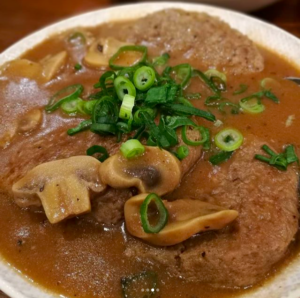 The regular-sized order of “Burger Steak” featured three large patties of delicious Australian beef cooked in a rich, thick mushroom sauce. Served with shallots atop the dish, Lolo and Lola‘s Burger Steak was a big hit with Nathan, who wolfed down two of the three patties. 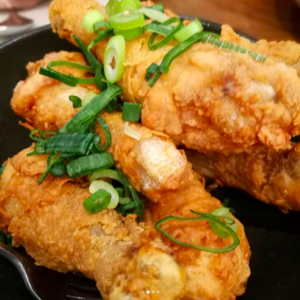 This Canberra Filipino restaurant did its best to replicate the famous Chickenjoy fried chicken. The flavour was quite similar, not exactly the same, but very good. The regular-sized order had about eight drumsticks, of which about half were taken by Nicola, can you imagine? Finally, a trip to Lolo and Lola wouldn’t be complete without their signature crispy bagnet. 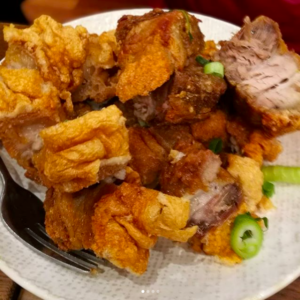 What makes theirs different from pretty much any other bagnet I’ve had is the brilliant skin, which expands to chicharon-size proportions. 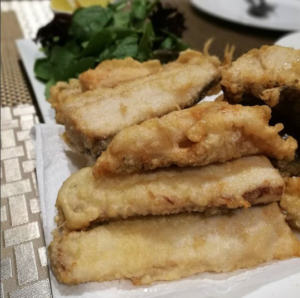 Crispy and delicious, this is always the highlight of our trips to this Filipino restaurant in Canberra. The total meal cost us less than AUD60, not too shabby for a family of four, with several leftovers for takeaway. 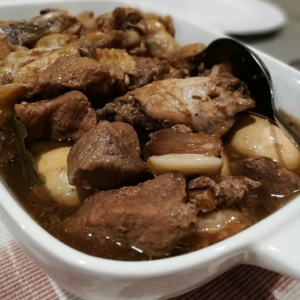 We’ve always enjoyed our time at Lolo and Lola’s, and highly recommend them for anyone in Canberra looking for a taste of Filipino cuisine at its homiest and most delicious. Lolo and Lola is located at 3 Watson Place, Watson ACT 2602. They don’t accept bookings, lol. Step 1. Prepare the sushi rice. Cook a cup of uncooked rice according to instructions. (I prefer one cup of uncooked rice to two cups of water.) While the rice is cooking, dissolve a tablespoon of sugar and a dash of salt in a third-cup of rice vinegar. Once the rice is cooked, transfer to a large bowl, and stir the vinegar into the rice until fully combined. Step 2. Prepare the other ingredients. Combine canned tuna and mayonnaise to taste. 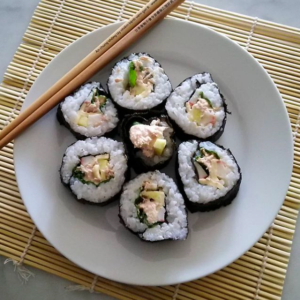 Other ingredients in this sushi are shredded imitation crabsticks, basil leaves, chopped cucumbers, and cheese slices, cut into strips. Also, in a ramekin, combine soy sauce and a small amount of prepared wasabi paste, for dipping afterward. Step 4. Roll with it! Using the mat, start to roll the nori upwards, moving the mat underneath so it doesn’t fold with the sushi. Step 5. Nomnom time! Dip in the soy-wasabi and enjoy! The other day, I saw this beautiful picture from Jeremiah Bishop, and y’all, I was trigged. I love me any good tomato dish, and the fresher the dish, the deeper the love. 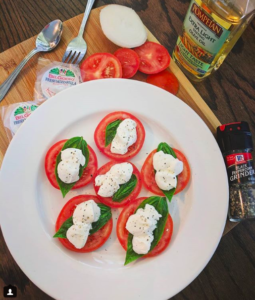 I’d seen caprese salad work before, but the mozzarella that Jeremiah put atop his salad was ridiculous. So I said to myself, I wanna make that. Problem was, I didn’t have any large tomatoes. (As of this blog, though, Caths and I got some truss tomatoes, and I am STOKED.) All I had on the countertop where we store our veggies in winter was a box of cherry tomatoes. So inspiration struck. I’ma make myself some hors d’oeuvres as a snack. 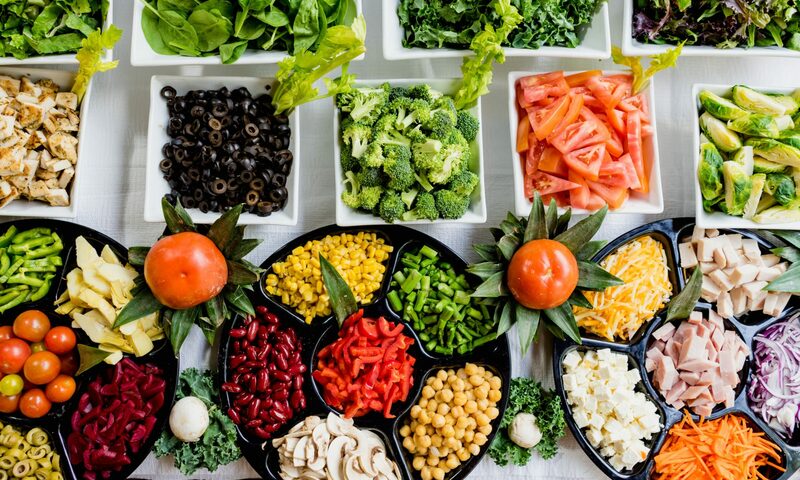 Monica Geller and the French call ’em “amuse bouche,” which roughly translates “amuses the mouth,” into and trust me, my palate was tickled. So what went into this caprese salad? 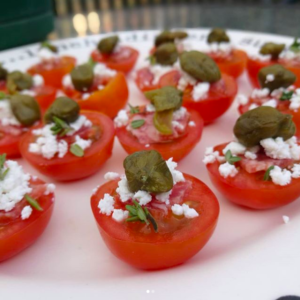 Cherry tomatoes, salami, feta, and capers! That simple! Chopped up the tomatoes, layered the salami, feta, and capers, and topped with with buds of thyme. I rather liked it!